During those halcyon years guest musicians playing with Savannah included Pat Halcox, Humphrey Lyttleton, Cy Laurie, Monty Sunshine, Sammy Rimington, Roy Williams, John Barnes, Phil Mason, Alan Elsdon, Keith Nichols and many others. We began recording with Lake Records in1990 since when we have accumulated 27 CDs. Louis Lince, Tony Pollitt and myself. 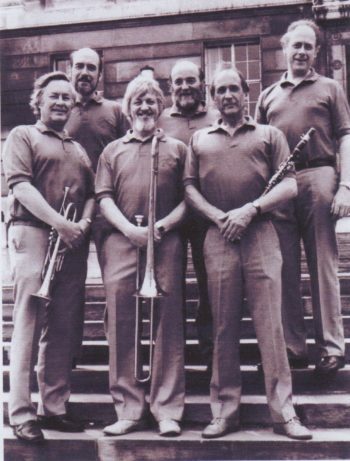 2010 saw some changes and band members were Bill Smith, Roger Myerscough, Brian Ellis, Louis Lince, Chris Marney, Tony Pollitt and myself. “Comments” at the foot of this feature. 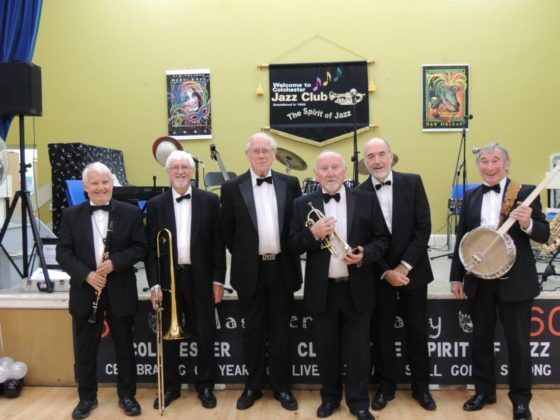 At Colchester Jazz Club: Roger Myerscough (Clarinet), Brian ‘Sam’ Ellis (Trombone), Tony Pollitt (Bass); Bill Smith (Cornet), John Meehan (Drums & Leader), Chris Marney (Banjo). Savannah at Hemsby Autumn Parade (with Eric Webster, Banjo, and Johnny Rodgers, Clarinet). 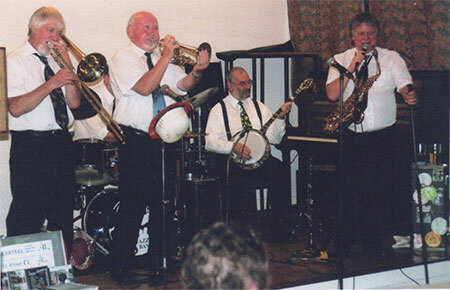 Brian Ellis (Trombone); Bill Smith (Cornet); Louis Lince (banjo); Rod Chambers (reeds). 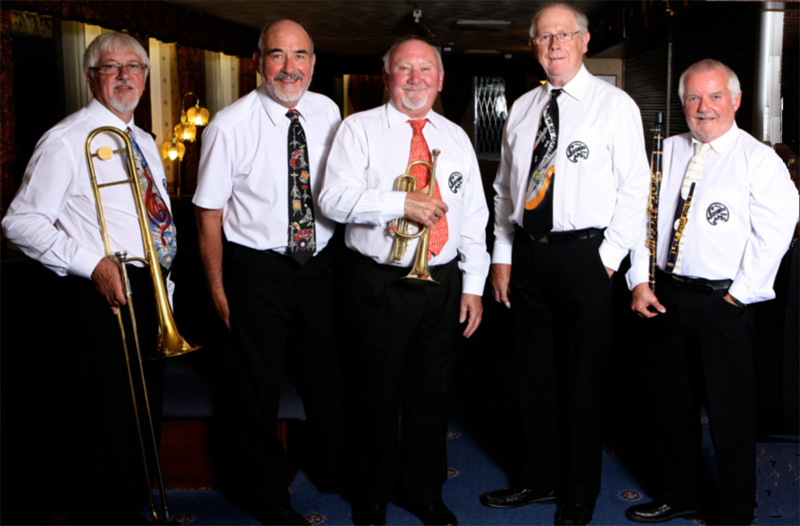 Surely the Savannah Jazz Band has been going for more than 40 years? 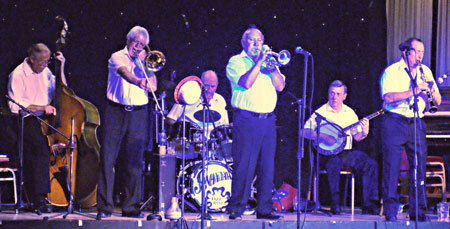 I recall the band at the Sports Guild mid 1960’s. At that time they had a Sousaphone player, a large Lad called Fred I think and the drummer was John Pardoe. John was a racing cyclist of some note at that time. They were a good Trad Band very enjoyable at the old cellar of the Sports Guild. Happy memories? TWO proud boasts used to surface in the one-time mill town of Huddersfield. One was that this gritty town on the edge of the Pennines in West Yorkshire used to produce the finest worsted cloth in the world. In the face of stiff competition from the rest of the world that may now be open to some dispute. Lake Records’ chief Paul Adams first met up with the band some fifteen years ago. “I’d heard rumours of them before that, but nothing I could really pin down” says Paul. ‘It had been an average, run-of-the-mill jazz weekend in a large ballroom and I was definitely restless. Then the Savannah took the stage. I remember thinking that’s more like it…. I think I’ve felt the same ever since‘. Paul Adams has spent a quarter of a century recording and he says “honestly, working with the Savannah is always one of the easiest and enjoyable jobs I do. They deliver the music honestly with conviction and never lose sight of the fact that the audience is there to be entertained. The proof of their popularity is in their large following and healthy album sales”. “I once described them as one of the best bands with their chosen style. I stand by that statement”. The love affair between them has continued unabated ever since. Humphrey Lyttelton and Paul Adams can’t both be wrong.